The name Gamal Fahmy immediately brings to mind the well-known journalist and TV presenter, a former Press Syndicate deputy chairman who over decades has established himself in the world of media with powerful articles and outspoken views on society and politics. But as it turns out Fahmy is also a painter and a sculptor. It had been sunny on Sunday 9 November but by the time I reached the Picasso Art Gallery the late afternoon had brought a cold breeze to Zamalek. Entering the well-lit hall, I was greeted by Fahmy’s warm smile while Albinoni’s Adagio in G Minor played. With a few scattered sculptures, paintings lined the walls ready for the opening of the artist’s debut exhibition, “Forms and Colours”. But for someone expecting a huge amount of attention from media and readers – some of whom had no doubt realised the intellectual depth underlying his writing, sensing an unseen creative dimension – he was remarkably relaxed. Fahmy’s interest in art comes as no surprise, though imagining him with paints and brush will no doubt raise eyebrows. “Over the past years, the media world held me into its web but I’ve always admired visual art and this exhibition is the culmination of a 30-year personal journey with art and life,” Fahmy explains as he walks me through his work. Whenever he had the opportunity, whether in Egypt or abroad, he would visit venues where treasures of the art world were on display, admiring the different schools and techniques that have emerged through the centuries. This recalled numerous stories he had told me – Fahmy is a great storyteller – of his travels, especially to France, where he would spend a lot of time at the Louvre, the Centre Georges Pompidou, the Musée de l’Orangerie, the Musée d’Orsay and many other spaces, often taking his daughter along so she could share in his passion. And even now, once Fahmy hears of anyone travelling, he will instantly start recommending museums and galleries at the destination. “Visual culture is very important to me, and its variety fascinates me. I have never restricted myself to one form or preferred one trend over another,” he clarifies. “Forms and Colours” is not an accidental title, nor is it merely a catch-all phrase to describe a heterogeneous collection. 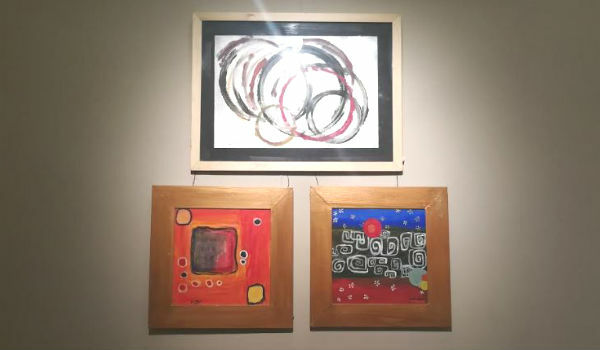 The show reflects Fahmy’s understanding of the visual world and the different if still coherently connected ways in which he transposes it onto canvas. If we were to insist on classifications, we might say that his work reflects a mixture of cubism and abstraction (expressionism and tachism) with elements of impressionism and art nouveau. Fahmy mixes and matches techniques, using sfumato and divisionism but perhaps most consistently impasto, which dominates many works. But since he doesn’t care too much about the technique he’s employing or the art school to which this technique subscribes – he says he only wants to express himself in the most suitable way – it seems more sensible to enjoy the forms and colours, avoiding classifications altogether. “The French painter Édouard Manet said that visual art is much richer and much more important when it is a reflection of nature and its components. 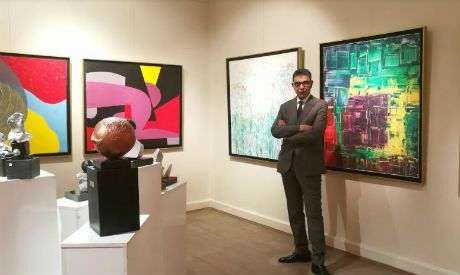 By this he means that the role of visual art is to teach us how to look, how to perceive,” Fahmy says, carefully choosing his words as he explains how the shapes and colours in his work reflect a deeply personal perception of the world and of emotion. As a child of that centuries-long process, Fahmy has a mind soaked in imagination. Even the most intangible impulse will push him to lock himself in his studio in Dokky where old newspapers protect the wood floor from stains and provide a unique refuge for Fahmy, where surrounded by buckets of paint, palettes and painting knives he finds his voice as an artist – a career he considered when as a young man he briefly enrolled in art school, an experience that seems to have marked him more than he could ever expect. Taking imagination as the basis of visual art, Fahmy believes that “not every painter is an artist, however every artist is a painter. There are painters who master the technique but they simply reproduce the objects they paint like copyists. An artist has an ability to imagine and feel things anew, he manages to enter different an often intangible layers of beauty”. He goes on to explain the role that colour plays in his view of the world and how its “trillion or more shades are all around us and therefore give me a freedom in expression”. The same applies to the infinite variety of shapes. Imagination means not merely copying reality. Indeed the only tangible subject in Fahmy’s work is the intangible: he is inspired as much by momentary as lasting experiences, emotions and music often evoke feelings that need to be expressed through painting. I suggest that another painting, with sharper strokes, was made while listening to Stravinsky, another favourite of Fahmy’s, and he smiles appreciatively. A frequent opera goer and the owner of a sizeable record collection, Fahmy’s refined musical taste is undoubtedly at the centre of all this – another abstract vehicle that allows him to savour the intangible. 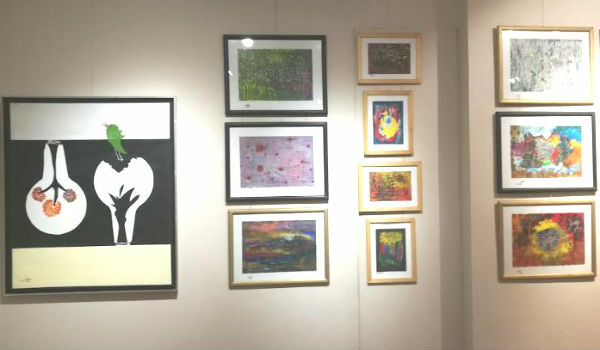 Though we know Gamal Fahmy mainly as a writer, the exhibition shows us not only a hidden layer of his personality but also thoughts that he cannot translate into words on paper. To the public, Fahmy the painter is something of a revelation: a popular media personality who for many years was showing only the tip of the creative iceberg through which he operates. This exhibition is the first opportunity to see Fahmy as a man with much deeper cultural understanding and passions, one to whom life and culture in the broad sense is a net of interlacing riches: language, art – and music. Let us hope this will be the beginning of many exhibitions to come. “Forms & Colors” continues until 21 December.